(Nanowerk News) Physics sometimes borders on light art. An international team headed by researchers from the Max Planck Institute for the Science of Light and Friedrich-Alexander Universität Erlangen-Nürnberg (FAU) can easily compete with the light artists, at least as far as the skill of forming light is concerned. 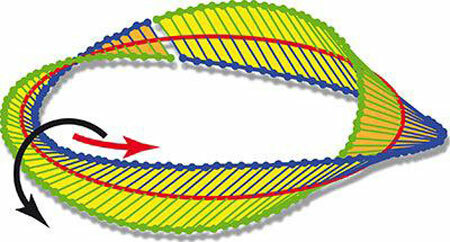 In their most recent work (Science, "Observation of optical polarization Möbius strips") they have wound a light wave into a Möbius strip: a strip that is formed into a closed loop, one of its ends being twisted through 180° with respect to the other one so that the strip has only one edge and one surface. The physicists use these tricks not only to prove how precisely they can meanwhile manipulate light, they are also creating tools which could be interesting for nanotechnology. A Möbius strip can irritate our perception. At first sight, the strip has two sides and two edges just like a normal ring made from a strip of paper, for example. If you follow one side or one edge with your finger, however, you arrive at the other side or edge after one circuit. The geometric form is named after the mathematician August Ferdinand Möbius who, simultaneously with his fellow mathematician Johann Benedict Listing, was the first to describe it with equations. This kind of structure is found only rarely in nature, although there is a protein, for example, which is shaped like a Möbius strip. It is more often to be found in engineering, in some gearboxes, for example, or as part of the construction principle of a fusion reactor that is intended to generate energy from the fusion of hydrogen to helium as occurs in the Sun. 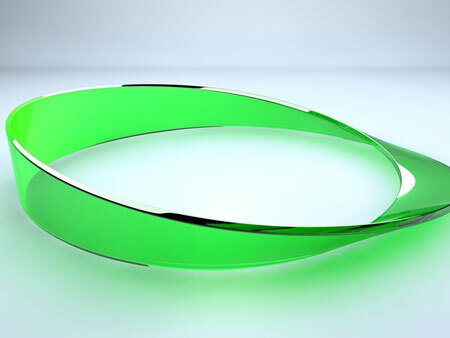 Just as a Möbius strip is used in technical applications in the macroworld, it could also be useful in nanotechnology, for processing materials, for example. The Möbius strip generated from laser light by the scientists from the Max Planck Institute for the Science of Light and Friedrich-Alexander-Universität Erlangen-Nürnberg (FAU), among others, could be the appropriate optical tool to produce the corresponding nanoscopic structures from a material. “Our optical Möbius strip also opens up new possibilities, however, such as using optical tweezers to guide microparticles and nanoparticles on complex paths,” says Peter Banzer, Leader of a Research Group at the Max Planck Institute in Erlangen, who developed the concept for the single-sided strip of light together with Ebrahim Karimi from the University of Ottawa. Biologists use optical tweezers to manoeuvre cells under a microscope, for instance, and material scientists use them as well to manipulate microparticles and nanoparticles in tiny machines. But before the Erlangen-based researchers found the Möbius strip with their optical instruments, they calculated under which conditions such a structure is generated. They based their work on an idea by Isaac Freund at Bar-Ilan University in Israel, who was the first to suggest that a Möbius strip can be generated using two crossed laser beams. “We’ve modified this approach in such a way that we obtain the structure in the focus of two beams where both are also very highly focussed,” explains Peter Banzer. For the experiment to work, the researchers have first to carefully prepare the two laser beams in the same beam path. The procedure starts with a single laser beam. The researchers begin by sending it through a filter which polarises light waves in such a way that their electric field vector rotates clockwise about its direction of propagation. This type of light is called right-hand circularly polarised by physicists. The researchers in Erlangen then direct the beam, which is rotating in the clockwise direction through a q-plate, an optical element developed by Lorenzo Marrucci and Ebrahim Karimi at the University of Naples. This element essentially comprises many layers of liquid crystal molecules between two glass panes, it being possible to apply an electric voltage to one of these cells. At a particular voltage, the q-plate rotates the polarisation of one part of the beam in the direction which is opposite to the polarisation of the other part of the beam. The waves of one-half of the beam thus then rotate anti-clockwise with respect to their direction of propagation. At the same time, the q-plate delays this part of the laser light to differing degrees at different locations. Physicists call this a position-dependent phase shift of one part of the beam. The phase characterises an oscillation and states at which point of its wave motion it is at a particular time. This causes the electromagnetic field of the light waves to point into very different directions at different positions in the beam cross-section in one part of the beam. When the two parts of the beam with the different characteristics are superimposed, they behave like a single laser beam. Peter Banzer and his colleagues exploit this when they send the laser light through the objective lens of a microscope that acts as a powerful lens. The lens focuses the light to a focal point. The outer light waves are diffracted to a much greater extent than the inner ones so that the electromagnetic fields of the light waves in the focal point oscillate in very different directions, depending on their position in the beam cross-section. And as the theoretical considerations showed, this results in a constellation of the polarisation traced along a circle around the focal point which closes to form a Möbius strip. This single-sided strip of light is in the focal plane perpendicular to the laser’s direction of propagation. The researchers not only depend on the calculations of the theoreticians to prove the existence of the Möbius strip, which the human eye cannot resolve at the focal point. “In Erlangen, we recently developed a method for measuring electromagnetic fields with very high resolution,” says Peter Banzer. To this end, the researchers place a tiny gold sphere measuring a mere 82 nanometres in diameter onto a glass plate in the focal plane. A small fraction of the light that is transmitted through the glass plate is scattered by the tiny nanosphere. “We can reconstruct the strength and the orientation of the electromagnetic field at any point in the focal point from the scattering pattern,” explains Banzer. This requires the researchers to collect the scattered and non-scattered light using a further microscope objective lens and measure it with the aid of a CCD camera.